It was a typical day in Uig Bay on the west coast of the Isle of Lewis. The year was 1831 and Malcolm Macleod had gone after a cow that had strayed from the herd to wander amid the sand dunes on the beach. As a prime example of being in the right place at the right time, it was on this trek to retrieve the cow that Mr. Macleod stumbled across a stone carrying case that had been buried in one of the dunes. It was this case that contained the beautifully carved items that are now famously known as the Lewis Chessmen. One tale that surrounds the discovery is that the case was unearthed by the cow rather than the man; this version of the tale, however, is generally discounted by the residents of Uig. The man versus cow theory is only the beginning in a long line of debates that surround the chess pieces. 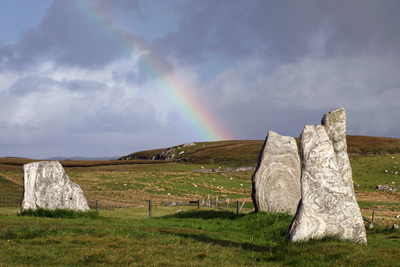 The argument that is most closely related to the discovery itself is how they came to be buried in the sand on the Isle of Lewis in the first place. The chessmen are in pristine condition with little to no wear and were found on the beach of a well-travelled water route between Scandinavia and Scotland. This, in addition to the strong evidence pointing toward Norwegian or Icelandic origin, supports the idea that they belonged to the stock of a trader or dealer who was most likely travelling along recognised trade routes by ship. A theory exists that the ship became wrecked and the dealer had buried the stone case in the sand in order to avoid paying the taxes on what would be considered, shipwrecked or not, landed goods. For those that prefer a little spice and intrigue mixed with history, there is also a belief that the case containing the chessmen was stolen by a sailor. The unknown sailor swam the case to shore and buried it for recovery at a later date; however, before the sailor could return to his treasure he was found guilty of an unrelated crime in a different country and sentenced to death by hanging. This unknown sailor was said to have made a death-bed confession regarding the theft and disposal of the stolen items. There are variations on this theme that have an assailant as equally unknown as the thieving sailor murdering the sailor for the treasure and becoming the person to perform the burial of the chessmen, the unrelated crime and the death-bed confession. On a slightly different tangent, research by David Caldwell of the National Museums Scotland suggests that the chessmen were discovered at Mèalasta, which is a few miles south of Uig. A medieval settlement was discovered to have existed at Mèalasta and if the pieces were indeed discovered at this settlement there would be an impact on the already existing debates. The pieces, if found where Caldwell suggests, would undoubtedly have been the possessions of a ranking local figure such as a religious leader or clan chief. How the pieces came to be buried in the sand in the Isle of Lewis is a matter of speculation and educated guesses. It is important to remember that at the approximate time the chessmen were made the Isle of Lewis belonged to the Kingdom of Norway and not to Scotland. There are no written records related to the existence of the pieces themselves until the year 1833 when the find was brought to the Society of Antiquaries of Scotland. The medieval pieces were sold by Malcolm Macleod to Captain Ryrie, also spelled Pyrie by some. Captain Ryrie brought the items to the society where it was stated in the recorded minutes that some doubt existed regarding the accuracy of where and how the pieces were found. After the meeting between Ryrie and the Society of Antiquaries of Scotland the pieces were sold once again and split up in the process. Kirkpatrick Sharpe had bought 10 of the chessmen and later added another bishop to his collection. The remaining 67 chessmen as well as the 14 tablemen were bought on behalf of the British Museum located in London. The British Museum is still in possession of the artefacts they had purchased. The collection of Kirkpatrick Sharpe was purchased by British politician and diplomat Lord Londesborough, who eventually sold them to the Society of Antiquaries of Scotland. The society donated the pieces to the Royal Museum in Edinburgh and they found a permanent home in the Museum of Scotland.